Late in the evening of Monday 9 June 1817, some ﬁfty to sixty men set out from the villages of Pentrich and South Wingﬁeld in Derbyshire on a fourteen-mile march towards Nottingham. They believed themselves to be in the vanguard of a Rebellion which would see ‘clouds of men’ descend from the north of England. Huddersﬁeld, Sheﬃeld, Wakeﬁeld and Leeds were scheduled to rise the night before, Nottingham, Leicester and Derby the same night and Birmingham the following day. This self-styled ‘army of regenerators’, anything upwards of 100,000 strong, would assemble in Nottingham, which was to be made the regional centre of government. From there, they would make their way up the River Trent to Newark. After seizing the arms depot and revenue in the Town Hall, they would sweep south to London and establish a government that would nationalise property, renounce the national debt and taxes and issue new money. Britain would become a republic under a new red, white and green tricolour ﬂag. The Pentrich rebels were led by members of their own community – men like William Turner, a 46-year old mason and former soldier, and Isaac Ludlam senior, a 52-year old stone-getter and sometime Methodist preacher, and commanded by a relative stranger Jeremiah Brandreth, an impoverished stockinger universally known as ‘Nottingham’ or ‘the Captain’, but immortalised in history as ‘the Nottingham Captain.’ Their march took them to the ironworks at Butterley where there was a standoff with armed special constables and then on to Eastwood where they found an expectant crowd awaiting their arrival. Towards Gilt Brook the rebels spotted an oncoming detachment of 15th Hussars that had been despatched from Nottingham Barracks. The sight of twenty Light Dragoons riding towards their position was enough to scatter the rebels in all directions, discarding armaments as they went. Most of the rebels were hunted down and the majority taken to Derby Gaol. Three of the rebel leaders, Brandreth, Thomas Bacon and George Weightman, were found guilty of high treason. Brandreth and Bacon were executed on the 7 November 1817, though Weightman had his sentence commuted to transportation. The Pentrich Rebellion has traditionally and understandably been recognised as a ‘Derbyshire Rising’ but in a new article Richard Gaunt reconsiders Nottingham’s role in the events immediately preceding the Rebellion. The episode will feature prominently in the new Rebellion Gallery, part of a £30m transformation of Nottingham Castle, due to open during 2020. Dr Gaunt’s role as Curator of Rebellion with Nottingham City Museums and Galleries (funded by Arts Council England) led him to re-consider famous episodes in Nottingham’s rebellious history since the Civil War, including Luddism and the Pentrich Rebellion (https://exchange.nottingham.ac.uk/blog/knowledge-exchange-and-impact-awards-2018-our-inspirational-winners/). Famously, E. P. Thompson saw Pentrich as an extension of Luddism, depicting Nottingham as a potentially revolutionary town. Although the leaders of Luddism successfully dissociated themselves from the Pentrich group, it is certainly the case that the rising was heavily influenced by the secret North Midlands Committee centred on Nottingham. The Rebellion was led by a Nottingham man, Jeremiah Brandreth. So was Nottingham a potentially revolutionary town? 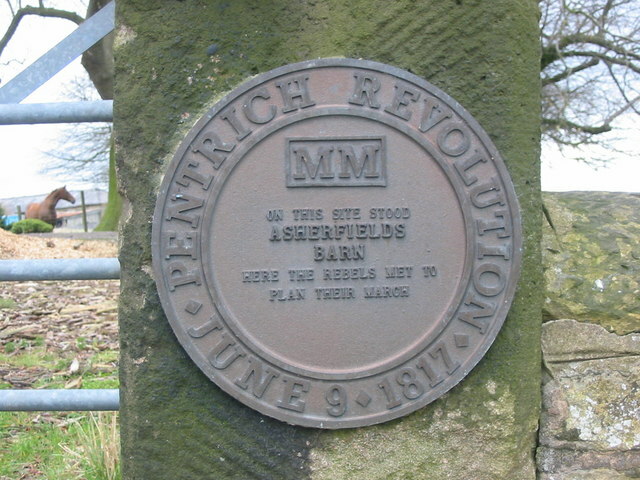 In spite of the origin of the rising in Pentrich, Nottingham was the focal point and was more heavily implicated in the events than has sometimes been appreciated. Without the strong geographical connections between Nottingham and the villages at the heart of the Rebellion, it is unlikely that the Rebellion would have taken its intended route, heading by way of Butterley towards the Forest at Nottingham. These connections dated back to the Luddite disturbances of 1811–12, but had been nurtured and expanded subsequently through the radical Hampden Club movement and the delegate system upon which it relied. Without it, Thomas Bacon (the originator of the Rebellion in Pentrich) could hardly have become connected with Nottingham radicals such as William Stevens, a leading member of the North Midlands Committee, nor introduced to those who had fallen on hard times, like Jeremiah Brandreth.